Actually this locomotive is stored here for SANRASM, but has not been moved due to the excessive cost, it is pretty well stripped by now.. This locomotive was built in 1921 as works number 22763 by North British Locomotive Co. 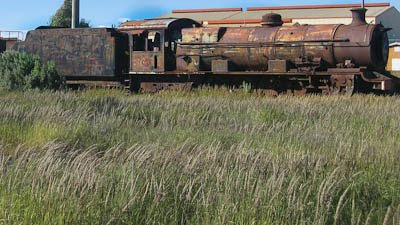 The Class 12 locomotive was the first South African Railways design. It was designed by Mr D.A. Hendrie, who was the SAR's first Chief Mechanical Engineer. The Class 12 was built by the North British Locomotive Company, and was placed into service between 1912 and 1922. 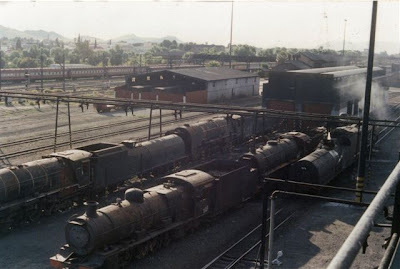 The original Class 12 was intended for heavy coal traffic on the Germiston-Witbank run, and spent most of their first years on this section before posted to other centres in South Africa. The Class 12A locomotive, which was introduced in 1919 just after WW I, was a very much improved version of the highly successful Class 12. The valve gear is Walschaerts. The Class 12A was designed primarily to supplement the Class 12's working between Witbank and Germiston. The Class 12A design marked the maximum size permissible at the time for type 4-8-2. This locomotive is marked number "2123" which belongs to the series of SAR Class 12A engines. No 2123 was built by North British Locomotive Co.
By 1969 many Class 12A locomotives were still giving good service, and were seen working in many parts of South Africa. Before the Class 15F's took over the De Aar-Noupoort section, the Class 12A's worked there on mixed traffic. There is little doubt that number 2123 also did service on this section. The locomotive has a Belpaire firebox. 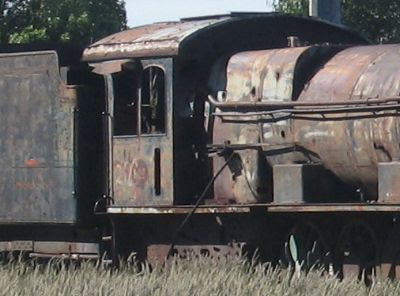 The Belpaire firebox is the flat sides and square corners in front of the cab. The Belpaire firebox was invented by Alfred Belpaire of Belgium. It has a greater surface area at the top of the firebox, improving heat transfer and steam production. Its rectangular shape makes attaching the firebox to the boiler more difficult, but this is offset by simpler interior bracing of the firebox. 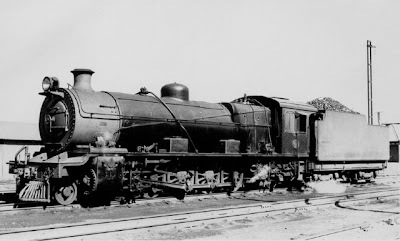 Many 12A's were reboilered to become Class 12AR - these engines received a different boiler, which did not use the the Belpaire firebox design, making it easy to distinguish between 12A's and 12AR's. The Class 12A and 12AR were very successful types. Good performance was accompanied by low repair costs, and modifications in design of details since entering service had been negligible. The Class 12A was the final, and certainly one of D.A. Hendrie's finest, designs. While the cylinders were increased to improve tractive effort, the boiler was redesigned and included a combustion chamber. February 1991 photo courtesy Richard Niven - De Aar, a "Worshond" (= Dachshund) i.e. 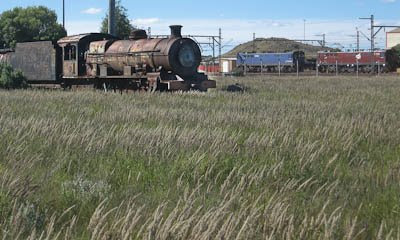 a rebuilt Class 25 condenser [25NC #3488] takes water, as scrap locos (12A #2123 in foreground, 15CA #2834, 24 #3652) rest. "Although very different in appearance, it is impossible to consider these two classes (12A & 12AR) separately as they differed only in their boiler design, and tended often to be allocated irrespectively of this. All were built as class 12A, and the class 12AR were reboilerings from class 12A. As may be expected from the class number, they were developed from class 12, and were considerably enlarged all round, other than wheel diameter. Apart from sheer enlargement, the Belpaire fireboxes, common to both classes, were extended in the 12A to include a combustion chamber." "At the front end, the Class 12 cylinders had small steam chests and indirect 'Z' ports, while the Class 12A had much more direct ports and therefore larger steam chests. With these more modern cylinders the sound of a class 12A locomotive, really opened up, was quite impressive." 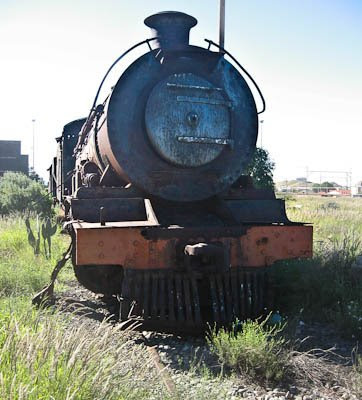 "The Class 12A un-rebuilt engines were, at the start (1973) of this survey, mostly in the Western Transvaal, divided between Springs and Germiston. One was at De Aar in the Cape Northern, and a few in the Eastern Transvaal at Nelspruit and Waterval Boven. All were used mainly on shunting, but the Springs engines were also used on the same line duties as recorded for class 12R. 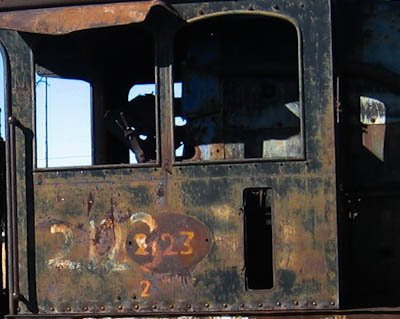 Quite suddenly in 1977 all the 12A's were concentrated on the Cape Northern where they shunted at De Aar, a few occasionally being moved to Beaconsfield, Kimberley." photo kindly provided by Derek Walker. 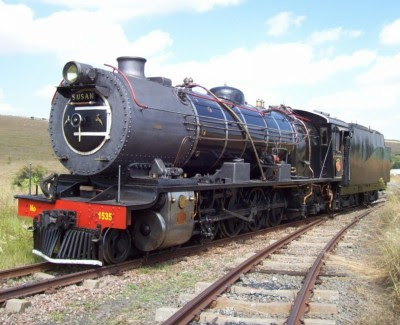 In 2009 Reefsteamers in Germiston has a Class 12AR (Class 12A reboilered) N0 1535 "Susan" in steam. This is the last remaining 12AR in existence. Derek's May 2009 note: "Susan is my favourite loco and I am attaching a pic for you if you want to use it. Sadly she is out of action once again, but we are all holding thumbs that she gets better soon, and doesn't end up being laid up permanently (which is a strong possibility)."